It’s not too late to book your summer adventure and have a language trip to remember with Cactus Language. We have more than 100 amazing destinations to chose from – but to make the decision easier we have chosen our top selection for June, just for you. Our selection is based on the following criteria: value for money, off-the-beaten-track destinations, and flight affordability (from the UK). You may have heard of Cadiz, but are not quite sure exactly where it is. Situated on the South Coast of Spain Cadiz is an hour and a half South of Seville, to the East of Portugal and to the West of Gibraltar. With miles and miles of pristine beach that offers great swimming and small surfable waves, Cadiz is the perfect location to spend a few weeks (or months) over the summer. Not only is Cadiz a great summer venue but it also has a beautiful old town that oozes everything you would want to associate with Spain and all things Spanish. There is no better, more authentic choice for a language holiday this summer than Cadiz. With general Spanish courses of 20 lessons per week at A?145 and flights to Seville and Jerez (both only a short journey from Cadiz) with Ryanair and Easyjet from around A?150* return – book now while it’s still cheap! Montpellier is situated on the South Coast of France, not far from the Spanish boarder and to the West of Marseille. A short 20 mins from the beach, the city centre is a charming collection of historical buildings which has been pedestrianised and is extremely enjoyable to walk around. The city is surrounded by vineyards, being in the centre of the famuos Languedoc region so you can do a bit of wine tasting whilst you practise your French. With an international airport served by various national and budget airlines, you can currently book a return from the UK for less than A?100* and a general French course is A?176 a week. 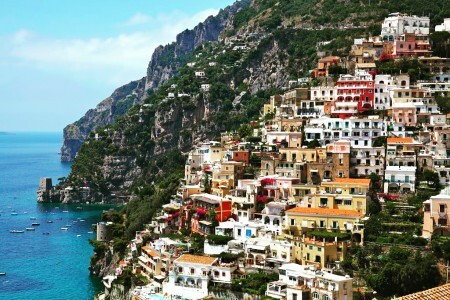 On the stunning Amalfi coast a trip to Salerno provides the perfect launch pad to investigate the numerous and beautiful towns along the coast – and the best way to do this is by boat. The school offers cultural lessons in additional to Italian and provides an intimate experience that allows you to full immerse yourself in the food, the drink, the culture and the language. Just a short distance from Naples airport, fly into Naples with Easy Jet or British Airways for less than A?120* per person, with a one week Italian language courses at A?172 per person.